Choosing floor tiles? A great flooring choice for hallways, kitchen diners, bathrooms, contemporary living spaces and even outdoors, floor tiles come in ever more varied design choices. Pick from natural stone, such as terracotta, limestone or marble, or from manmade materials, such as porcelain, ceramic or concrete. Find out everything you need to know about floor tile materials, installing floor tiles, and tips for floor tile maintenance. Natural or manmade floor tile materials? Natural stone tiles have unique textures and tones, but are more likely to crack or scratch than a manmade materials, and may need sealing once laid – and resealing in future. Manmade materials are usually more affordable and come in a wide range of designs, but tend not to have natural stone’s character. Granite is very hard, available in many colours, and if sealed and polished, resists scratching. However, it can crack. Ideal for kitchens, living and hallways. Marble is porous so choose honed or polished finishes, particularly in a kitchen. Available in a range of colours, it’s a good choice for bathrooms. Limestone comes in earthy shades and both textured and polished finishes. It can stain and scratch, so avoid putting it in high traffic areas, such as kitchens. Slate is durable and comes in a range of dark, earthy shades. Its surface is naturally textured, but honed, smooth finishes are available. A good option for kitchens, bathrooms and living rooms. Travertine is soft and porous with a natural pitted surface, although honed and polished tiles are available. It can scratch and stain, so reseal regularly, and put in bathrooms rather than kitchens. Quarry tiles, usually made from clay, are unglazed and require sealing. Hardwearing and durable, they are perfect for hallways, kitchens, living spaces and outdoors. Terracotta tiles, like quarry, are made from a mixture of clays, but fired at a lower temperature for a more rustic look. Available in a range of earthy colours, they need sealing. Encaustic tiles are ceramic tiles, with the design not a product of the glaze but of different colour clays. Typically used in hallways, they need regular sealing. Cement tiles will stain unless they are sealed. Incredibly hardwearing, they are a good choice for contemporary living spaces and kitchen diners. Quartz tiles, made from a composite of resin, quartz, sand, colour pigment and mirror flecks, come highly polished. Hardwearing and perfect for contemporary kitchens and bathrooms. Glass tiles offer a tough, durable, easy to clean floor for bathrooms. Glass is prone to scratches, however, and will break if something heavy is dropped on it. Porcelain tiles are dense, smooth and impermeable, making them suitable for all rooms, including the garden. They can mimic the look of wood, encaustic patterns, natural stones and even concrete. Ceramic tiles, generally more affordable than other tiles, come in a wide choice of designs. 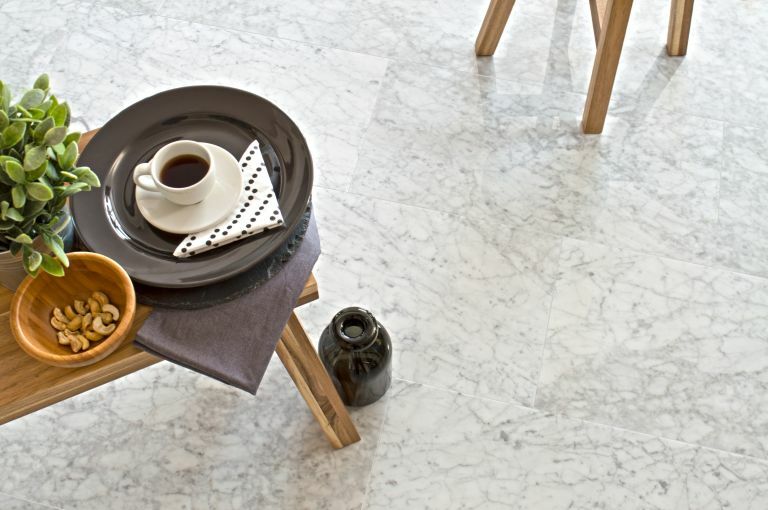 A little more prone to chipping and wear than porcelain tiles, they are hardwearing and will work for most rooms. Installing tiles is a job that even beginners to DIY can tackle. Simply start by finding the centre of the room and laying out the first four tiles with spacers around that point. Then, lay out a few more tiles in each direction to ensure you don’t end up with any awkward, thin slivers of tile at the edges of the room. This done, you can apply adhesive in small sections to keep it from drying out. The difficulty comes in the cutting, with some materials trickier to tackle than others: porcelain is harder to cut than ceramic, and natural stone, in particular thicker tiles, is more heavy-going than porcelain. So it’s important to invest in tile cutting tools appropriate to the material. And, if you’ve chosen expensive tiles, we’d recommend you call in a professional. For more tips, follow our guide to fitting floor and wall tiles. Tiles heat up quickly and retain heat well, making underfloor heating an efficient option. Tile thickness has an impact on the heat-up time, with a thicker tile taking slightly longer to warm-up than a thinner one. Use a flexible adhesive and grout to allow for normal thermal movement. The finish you get is only as good as your subfloor, which must be clean, flat and movement-free before you start laying the tiles. Larger format tiles need the subfloor to be absolutely perfect to lay flat; smaller tiles will give you a little more leeway with minor imperfections. Vacuuming or sweeping regularly will help keep your tiles scratch-free, while cleaning up spills quickly will help avoid staining. Manmade tiles can usually just be mopped with a mild detergent for floor tiles, but use warm water only for natural stone to avoid removing or dulling the seal, or damaging the stone’s appearance. Terracotta tiles can also be resealed to maintain their soft sheen appearance. Choose large format tiles to complement a big, contemporary or industrial-style room; smaller tiles are perfect for a vintage, homely look in a more compact space. Bold colours or monochromes in graphic designs are a popular look for the year ahead, as are wood-effect tiles in a parquet layout. Want to stretch space visually? Laying tiles diagonally will trick the eye into seeing the room as larger than it really is. Also, consider how the layout of the tiles on your floor might contrast with or complement that of your wall tiles.